With the Decision No 1/95, EC-Turkey Association Council put the Customs Union between Turkey and the EU into effect, and there have been questions concerning its scope and functioning since then. With the increasing liberalization of trade at global scale, the EU has concluded trade agreements with third countries and blocs, which in turn jeopardize Turkey's rights and privileges gained by the Customs Union. In this respect, this paper analyzes the current problems of the Customs Union with reference to the primary documents of EU-Turkey relations and offers recommendations. The first part presents some details of the Ankara Agreement, which constitutes the basis for EU-Turkey relations. The following part analyzes challenges derived from the structure of the association relations. Turkey's absence within the consulting and decision-making processes and gaps in the dispute resolution mechanisms are the two main challenges that complicate EU-Turkey relations. This paper argues that free trade agreements with third countries, the question of visa for Turkish nationals, and transport quota implemented to Turkish vehicles constitute the main obstacles against the proper functioning of the CustomsUnion. Therefore, the inclusion of Turkey to the decisions related to the customs union is necessary for a viable solution. Furthermore, this study stresses the importance of abolition of the visa regime for business purposes. Last but not least, this paper assesses that transportation quotas are in strict contradiction with the idea of a common market. In short, all these issues should be covered by a revision agreement since EU-Turkey relations has a sociological perspective as well as its economic and political aspects. Agreement Establishing an Association between the European Economic Community and Turkey and the Additional Protocol (1973) Official Journal of the European Communities. Vol. 16, No. C113, December 24, <http://ec.europa.eu/enlargement/pdf/turkey/association_agreement_1964_e n.pdf>. Akses, S. (2010) “İKV Değerlendirme Notu: AB-Güney Kore Serbest Ticaret Anlaşması ve Türkiye'deki Etkisi”, <http://ikv.org.tr/images/upload/data /files/ikv_degerlendirme_notu_-_ab-guney_kore_serbest_ticaret_anlasmasi_ veturkiyedeki_etkisi.pdf>. Case 2/73 Riseria Luigi Geddo v Ente Nazionale Risi, <http://eur- lex.europa.eu/legal-content/EN/TXT/?uri=CELEX:61973CJ0002>. ISNAD Dartan, Muzaffer , Göral, Emirhan . 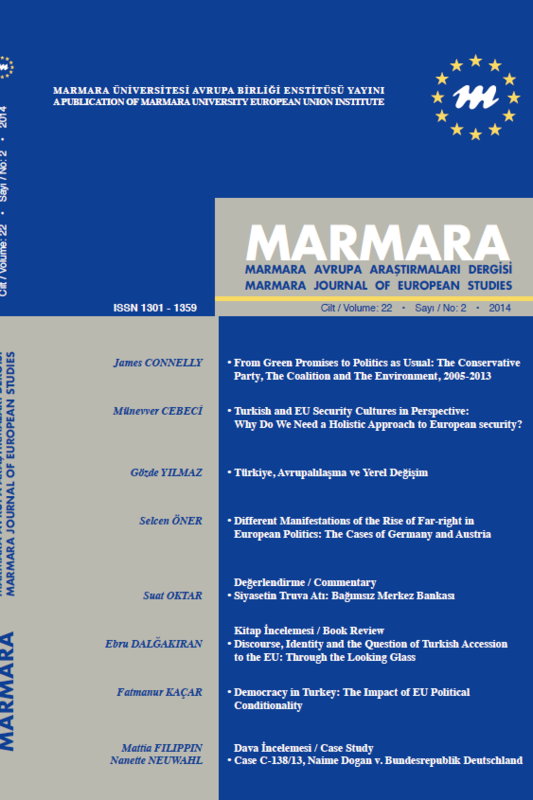 "THE CUSTOMS UNION IN THE CONTEXT OF EU-TURKEY RELATIONS: AN EVALUATION OF CURRENT DEBATES". Marmara Üniversitesi Avrupa Topluluğu Enstitüsü Avrupa Araştırmaları Dergisi 24 / 2 (December 2016): 1-30.